And if this doesn’t fix it – and I don’t see why it should, to be honest – the Jeep will get to visit its expensive friend in the nearest town. Again. Joel, is that gaping orifice on the front of the “airbox” somehow protected by something on the underside of the hood? One wonders what keeps the critters out of there. Looks like a mouse/rat funnel to me. What’s the year and model of your Jeep? I’m curious to see if there are any service bulletins out for it. Any way to pressurize the cooling system while the engine is cold? 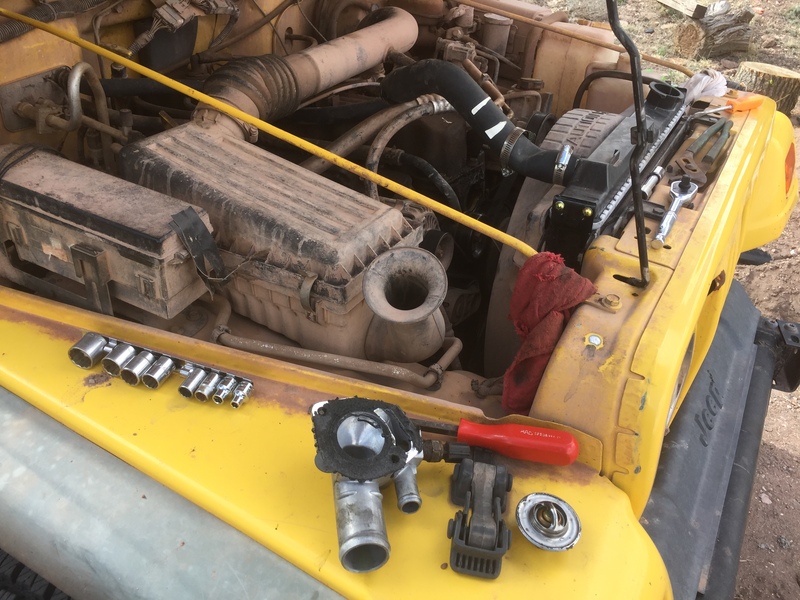 Radiator pressure tester rigs aren’t common among home mechanics, but if there’s a way to pump the cold system up to operating pressure – usually 13-15 PSI – a clean engine, bright green antifreeze it helps a lot (unless the leak is coming from heat-induced expansion of joints….. ). What’s the year and model of your Jeep? Hey Joel, I took a look and while there are a lot of TSB’s on the 2001 wrangler, coolant leaks aren’t one of them. Here, you can take a look. You may also find this interesting. It’s a list of complaints about coolant leaks on the 2001 Jeep Wrangler. If your local town has a Checker or Autozone or other national chain auto parts store, they will loan you a raditor pressure tester for free. I just used one a few months ago to find a leak in my F-150. Good luck! I have a 1994 XJ with a 4.0, and had intermittent weepage from the thermostat housing for years. Corrosion can make the casting slightly porous, but I ultimately found that the lower bolt was bottoming out in the head, and keeping it from a good seal. Adding a washer for spacing fixed it. You could say I was quite displeased with myself for not figuring this out a few years earlier. Make a gasket out of thin cardboard, it will fill in the gaps that are too small for your eye to see. Don’t forget to use gasket shellac on both sides.